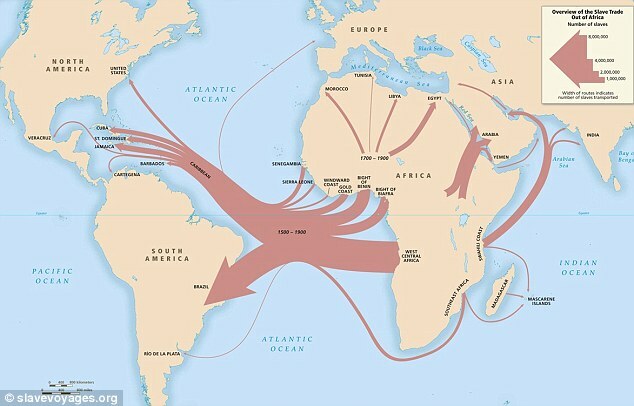 This map shows the areas around the world African slaves were shipped to. Slavery has existed in our world from the beginnings of civilization. This has been an acceptable trade and was usually related to warfare and capture. 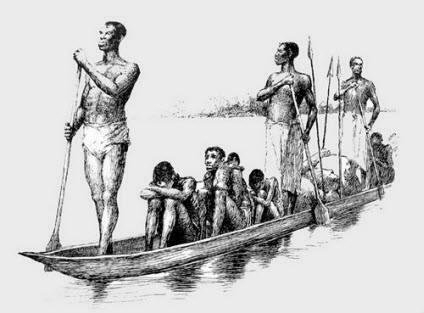 Over four centuries of the slave trade, millions of Africans were forced out of their home and shipped to locations all around the world. Majority of the Africans went to work in plantations in Brazil and the Caribbean. A smaller percentage were delivered to North America, Spanish America, and also to Europe. European demand for slaves was the major cause for the commerce of Africans. Soon after the Europeans discovered the process of making sugar from the Arabs, they started to create sugar making plantations all around the Mediterranean. This was one of the first industries that required huge capital investment, advanced technology, and disciplined workers. This work was very difficult and also very dangerous. Also, because serf labor came with many limitations and wage workers were not readily available, this industry resorted to using slaves to fulfill the production needs. Slavic people from the Black Sea area were first used as slaves in these plantations, but when Constantinople was conquered by the Ottoman Empire, the availability of Slavic slaves diminished. During this time, Portuguese explorers looking for gold, found humans for sale. Due to this reason, African slaves were readily available and supplied by the Europeans when they were later needed in sugar, tobacco, and cotton plantations in the Americas. Compared to all other regions, the West Africans seemed to be the best choice for slaves. In Europe, the Slavs were no longer available for slavery and the marginal Europeans were Christians which did not allow them to be slaves. Also, the Native Americans were not immune to European diseases and quickly died off while the European indentured servants were too expensive to hire. Most of the West Africans were immune to European as well as tropical diseases, had experience in farm labor, were not Christian, and were readily available because of their location and due to the African trading network. All these characteristics allowed the West Africans to be the most reliable slaves. Although the Europeans were able to trade with African merchants on their own terms, they did not directly acquire these slaves. Because the Africans were able to defend themselves against foreign invasion and because they were most interested in trading peacefully, the Europeans did not try to forcibly take slaves. In addition, Europeans were not immune to many of the tropical diseases in Africa. For these reasons, Europeans resorted to staying on ships or in settlements on the coast while the African merchants or elites brought slaves to them. In return for the trade, Africans would receive many foreign goods. In exchange for slaves, they would get European and Indian textiles, cowrie shells, European metal goods, firearms & gunpowder, tobacco, alcohol, and decorative products such as beads. 'Albeit it was mainly the Africans selling other Africans into slavery, the people were mostly social outcasts. These people may have been prisoners of war, criminals, debtors, or people who have been given up or "pawned" during difficult times. In this way, Africans were not selling their "own." During this time period, West Africa was divided into numerous small-scale, separate, and most of the time, rival communities consisting of cities, kingdoms, clans, and villages. Therefore, because the people had not yet established a sense of African identity, they did not hesitate in selling off outsiders who are vulnerable and lacked the protection of membership in an established community. This, in turn, allowed provided many African elites with economic and political advantages and success.